This is the Braidstane line of the noble house of EGLINTON. ROBERT MONTGOMERIE, second son of Alexander, Master of Montgomerie, and brother of Alexander, 2nd Lord Montgomerie (ancestor of the Earls of Eglinton), obtained for his patrimony, from his grandfather, Alexander, 1st Lord Montgomerie, the lands of Braidstane, and thus became its laird. JOHN MONTGOMERY, who settled in Ulster during the early part of the reign of JAMES I with his cousin Hugh, 6th Laird of Braidstane (afterwards 1st Viscount Montgomery), his lordship having brought several of his clan from Scotland, that they might settle upon his new estates, and assist upon the plantation of the country. HUGH MONTGOMERY, of Maghera, County Londonderry, MP for Newtownards, who had been left for dead in attempting to defend his father; but recovering from his wounds, he lived to an old age, on his property at Maghera, to which he removed after the attack on his paternal dwelling. Mr Montgomery represented the borough of Newtownards in Parliament, 1634-41, and lies buried with his father in the church of Donaghadee. HUGH MONTGOMERY, of Maghera, was an officer in the army and distinguished himself against the insurgents in 1641. He was captain in Sir John Montgomery's regiment, and afterwards Major under Sir Charles Coote. WILLIAM MONTGOMERY, of Maghera, who espoused Mary, eldest daughter and co-heir of Captain James Magill, of Kirkistown, County Down, by which marriage he acquired a great accession of property. Captain Montgomery was an officer of Dragoons, who served with reputation in Spain under Charles Mordaunt, the great Earl of Peterborough. He purchased, ca 1715, the estate of Grey Abbey from his kinsman, James Montgomery, and rebuilt the mansion house, the former having been burnt accidentally in 1695. Anne Catherine; Emilia Georgiana Susanna. Lucy Florentia; Edith Cecilia; Charlotte Henrietta Emily; Evelyn Mary. MAJOR-GENERAL WILLIAM EDWARD MONTGOMERY JP DL (1847-1927), of Grey Abbey, High Sheriff of County Down, 1900, who espoused, in 1891, Alberta Victoria, daughter of Major-General the Rt Hon Sir Henry Ponsonby GCB, by whom he had no issue. MAJOR-GENERAL ROBERT ARTHUR MONTGOMERY CB CVO (1848-1931), of Grey Abbey, who married Maria Maud, second daughter of Richard Gosling, by whom he had no issue. Flora Anne Selina, b 1974. GREY ABBEY HOUSE, Greyabbey, County Down (also known as Rosemount), derives its name from the late adjacent 12th century Cistercian abbey. The manorial demesne, long known as Rosemount, was established in the early 17th century, and the present house was built in the early 1760s. In 1634, his son, Sir James, built a ‘noble house and stately out-offices’. a double roofed-house and a baron and fower flankers with bakeing and brewing houses, stable and other needful office houses….built after the forraigne and English manner; with outer and inner courts walled about and surrounded with pleasant gardens, orchards, meadows and pasture inclosures under view of ye said house called Rosemount from which ye manner taketh name. The same was finished by …Sir James AD 1634. "...only some small convenient additions of buildings and orchards were made by ye sd William and improved lately by his sd son James. " Rosemount was the mansion house of Sir James Montgomery …he built here a noble house and stately out-offices (which were afterwards burnt down Ann. 1695) and laid out fine gardens behind it, executed in the form of a regular Fortification, some Bastions of which are yet to be seen. However the present worthy proprietor [William Montgomery] has built a neat and commodious house with handsome offices on part of the site of the former offices, and laid out his gardens and Out-grounds about it in elegant taste. This house, too, built in 1717 by William Montgomery (d 1725), was itself later burnt. In the absence of surviving 17th or 18th century Montgomery estate maps (no doubt burnt in one of those fires or in a fire in a fire in the agent’s house), it is difficult to be certain where exactly these various early buildings stood. The house, which was accidentally burnt in 1695, may have stood in the vicinity of the present stable yard, and indeed could have the 1717 house, but some believe could have stood on the seaward side of the present mansion. The ‘fortified’ garden may have occupied what is now the walled garden to the north-west, but there seems to be no physical sign of this today. It is possible that the present yard, being a complex of 18th and 19th century buildings, could incorporate elements of the ‘handsome offices on part of the site of the former house’, mentioned by Harris in 1744. The present house, Rosemount, located on a rise in the park, was built from 1762 by William Montgomery, who had succeeded to the property in 1755. It was still being erected when James Boswell visited the place on 2nd May 1769 and noted the excellent house of Mr Montgomery’s own planning, and not yet finished. The house is a three-storey block over basement, Palladian in style, with six-bay entrance front, hipped roof and balustraded roof parapet. There is a three-sided bow in the centre of the garden front (Gothic windows on ground floor, inspired by Castle Ward, are a later addition, possibly ca 1785) and canted projections and diagonally set single-storey side porches on the side elevations, the latter being added in 1845-6 to design of James Sands, commissioned by Hugh Montgomery, who succeeded to the estate from his father, William, in 1831. The roof-balustraded parapets were also added in the 1840s. A single-storey smoking room extension was added to the north-east in 1895. The existing naturalistic landscape park with its woodlands, shelter belts, meandering walks and sweeping carriage drives, was laid out as a setting for this house in the 1760s or 1770s. The old abbey ruins were made a feature of this park and a sunken drive was created below the garden front of the house. In the 1840s, a masonry pedestrian humped bridge was built, allowing access to the park across this sunken way. Near the abbey a well house was built in the 1770s, known as ‘The Nun’s Well’, possibly replacing a medieval well-house mentioned by Harris in 1744. The stable yard, being a complex of one and two-storey ranges of both 18th and 19th century construction, including a free-standing game larder, are hidden within the park, as is the walled garden lying to the north-west. The three 19th century gate lodges were added in the 19th century; viz. the old gate lodge ca 1820, known as Rosemount Cottage, made redundant by a re-alignment of the public road; the Abbey entrance of ca 1815-20; and the village West Gate Lodge of ca 1860. The entrance lodge is in Georgian-Gothic style, as is the pinnacles gate-screen, and appears to have been inspired by the lodges at Mount Stewart, designed by George Dance (the younger), in 1808-09. In 1843, the garden designer, Ninian Niven, made some alterations to the park layout, notably adding a parterre to the terrace on the north east side of the house. This has been grassed over in recent decades. The parkland survives today in good order and contains fine mature trees with shelter belts and woodlands down to the lough shore. Contemporary ornamental planting is maintained to the east and west of the north front; the south entrance front is in lawns, with a sweeping carriage drive. Part of the walled garden to the northwest of the house is cultivated. A portion of what was once a much larger orchard is retained. William Montgomery, who lives with his family at Grey Abbey estate today, is descended from the younger brother of the 1st Earl of Mount Alexander, Sir James Montgomery, who was given the Grey Abbey estates which remain, in part, in the family today. The family is, therefore, of the same family but not directly descended from him. In early Victorian times, the family owned land in the Ards Peninsula extending to some 5,000 or more acres, though this figure would have been closer to 100,000 acres in the 16th century. 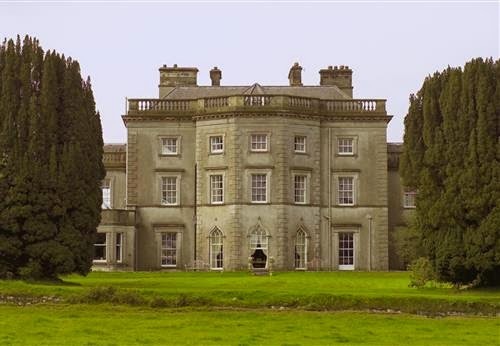 The Montgomerys also owned the Tyrella estate, near Rathmullan, County Down - it having come into the family through the marriage of William Montgomery to Suzanne Jelly in 1749. Mrs Daphne Montgomery is the granddaughter of 1st Viscount Bridgeman. William Montgomery is a Trustee of Weston Park estate in Shropshire. The Bridgeman family inherited Weston Park itself during the 18th century and today it is run as a trust by the Weston Park Foundation. Images of Grey Abbey House by kind permission of William Montgomery. First published in May, 2010; revised in 2014.